The flexibility and durability needs of this design have required us to delve deeply into the inherent qualities of various woods, and one thing is certain: all woods are not created equal. Some have gorgeous figure, some gorgeous color, some gorgeous grain. These aesthetic qualities are what we look for when choosing the wood for our chair seats, arms and headboards. Other woods have less figure, but have knot free, stronger grain. These are what we choose for the back posts and legs of our chairs. To function as required, the woods we choose for the flexible slats in our floating back design must satisfy a distinct set of demands. Most importantly, these woods need to be resilient: that is, able to be bent over and over again, always returning to their original shape. They must be durable over decades of use. They must be flexible, and never brittle. 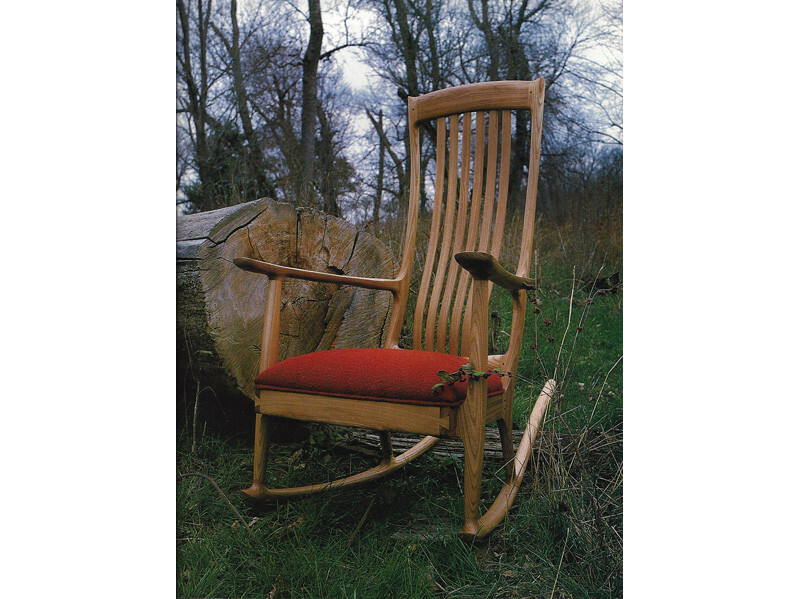 Twenty years after I started making Floating Back chairs, a few slats began to fail. A couple of times a year I would get a call from someone with an older chair who had a slat that needed to be replaced. 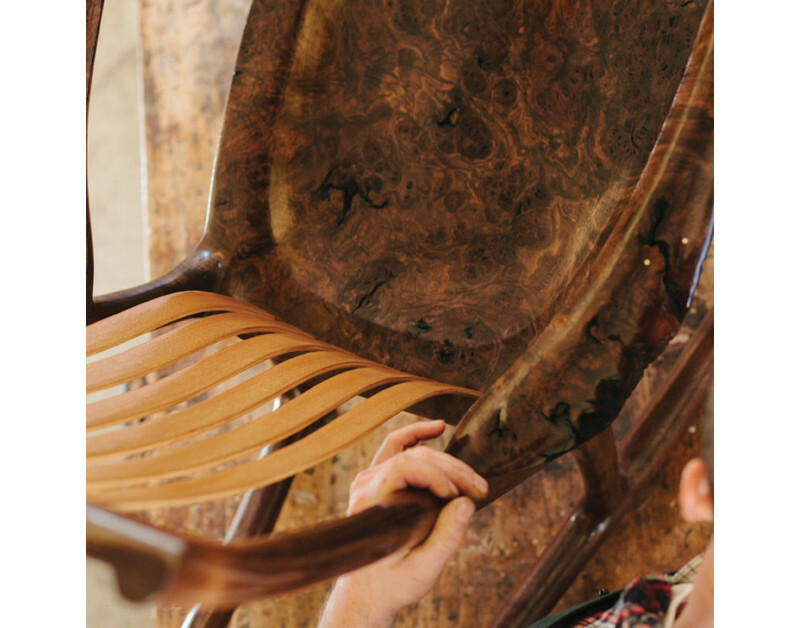 Slats of one species of wood, however, have never been returned in the more than 40 years that we have been making our Floating Back chairs: red elm. Ulmus rubra, or red elm (sometimes called slippery elm), is a little known tree that grows in the Eastern U.S. and the Midwest. Unlike its cousin, American elm, red elm is almost exclusively a forest tree. Both species have been impacted by Dutch elm disease but slippery elm has been more reduced by the elm bark beetle, Xanthogaleruc luteola. Ulmus rubra is closely related to European elm but the Old Country cousin does not have the intrinsic qualities that we are looking for in slat wood. Apprentice Bobby Corns demonstrates how to remove a red elm backslat from Erickson Woodworking on Vimeo. I first heard of red elm in the 1970s when I read a book about Rushton canoes of upstate New York. First made by Henry Rushton in the 1880s, the canoes incorporated ½” by ½” strips of Ulmus rubra for the ribs of these hardy yet extremely light craft. Rushton had found that the wood worked well for steam-bending, that it was very strong, and quite light. This caught my eye way back then, because I was just beginning to develop our chairs’ back support system. But it was not until a year or two later in 1976—when I was working in a small riverboat town along the Missouri River— that I used some local red elm for chair parts. It was as strong as oak but much lighter in weight. In the early 1980s my Uncle Dewaine took me for a drive heading south from his town in central Nebraska toward the Republican River. We passed the site where my great-grandfather, Anders Eriksson, homesteaded in 1878, and we kept going until we came to a large, dead red elm tree that Dewaine had noticed a month or two earlier. I evaluated the tree and realized that it would make excellent lumber. My uncle agreed to take it to the local sawmill and have it cut into boards for me. A year later, I made him a rocking chair out of this wood: the first chair made entirely of red elm (plus upholstery) that I’d ever made. Since then, we’ve been encouraging clients to choose red elm for the back slats of their chairs whenever they order a chair in walnut or other woods that look good with the rich brown color of Ulmus rubra. 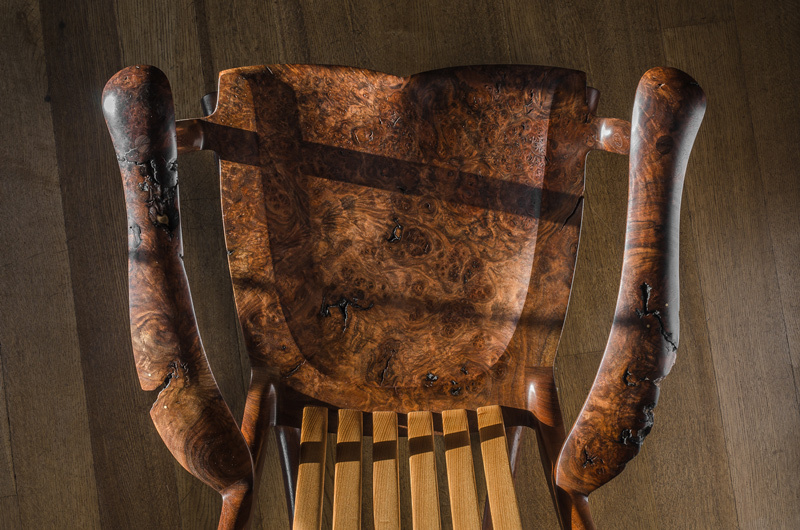 This wood is hard to find in the quality we need for our specialized purpose, but we hoard a small supply and save it to furnish the comfort and durability that we expect each of our chairs to provide. Hans Wegner declared “a high quality wooden chair should give 50 years of daily use.” We subscribe to this famous Danish chair designer’s manifesto, and red elm helps us on our way.